I’m at the point in the game where you must complete the Tomb challenges in order to progress the story. Unlike the previous main story quests, you must play them in the Freeplay mode. Spread across the world are four different temples, all of which require you to complete different tasks in order to open them. These include tasks like defeating a certain number of opponents with your melee attacks, defeating a certain number of enemies with your Ultimate, collecting a certain number of chests, and so on. As you complete the set of tasks required for each tomb, the door opens and you collect the item within it. Once you get all four, you’re done and can move on. For a game that was already struggling with immersing players in its narrative, this is a real punch to the gut. Did Yvenia really need me to open 15 treasure chests to prove my worth as a hero? Also, how the heck is she even tracking that from beyond the grave? You’re essentially served with a laundry list of to-do items that feel like some of the most blatant campaign padding I’ve seen in quite some time. And speaking of Yvenia, getting 15 treasure chests through world events or other natural means is a pain. You don’t encounter them fast enough, making the process a real slog. Your best bet is to follow a guide online to get the chests that drop into the world quickly just to be done with it. This part of the game is the first time where its deficiencies really got to me. Even if it gave me more opportunities to fight and fly, its blatant attempt at lengthening the campaign are too hard to ignore. Really hoping the ship rights itself after I get through this crummy mission. 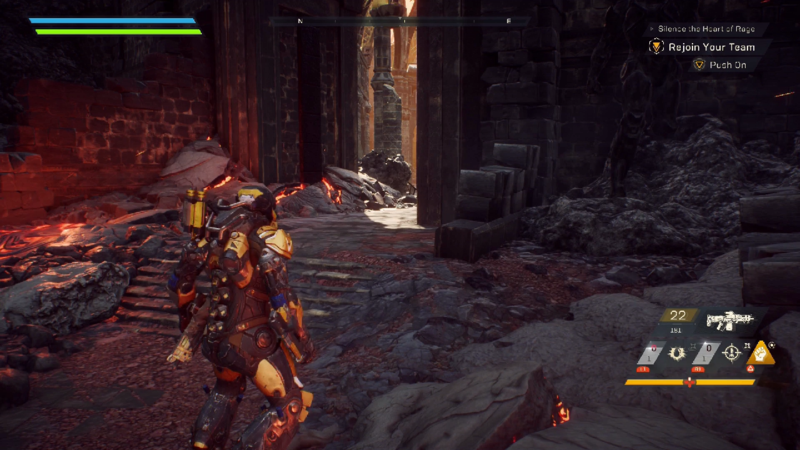 The more I hear about Anthem, the more it sounds like a game that the people who bought it really want to like — or at least want to feel like they justified their purchase and faith in BioWare, even after the latter took a knock with Andromeda — but which they’re finding increasingly difficult to enjoy the further they go. It seems particularly prone to falling foul of all the annoying things every MMO ever has done over the years. They supposedly have a ten-year plan for this game. They’re going to struggle to hold on to the players necessary to make even a couple of years viable at this point. I wouldn’t go quite as far as to say it’s faith that keeps me hanging on. I genuinely believe there are redeeming qualities to Anthem as it stands. The game looks great. Flying around the world is a lot of fun. Combat is also a lot of fun, as there’s a lot of great opportunities for coordination between the different hero classes. That’s the core of the game, and they got enough of that right where I can understand how some players are still really into the game in spite of its myriad of periphery issues. That said, if the plan truly is to support what’s here for 10 years…they’ve got their work cut out for them. Scaled out that far ahead, and those periphery issues really add up. I’m already starting to hit a snag in the campaign, and I’ve read that its endgame content currently is weak.